You have posted 1 times within 60 seconds. A spam block is now in effect on your account. You must wait at least 300 seconds before attempting to post again. If it's on your own site, it's easily fixable. If it's on .org then we need to ask @Linc to fix it. same with me on vanilla forums. just another way spammers can tie someone up in knots. 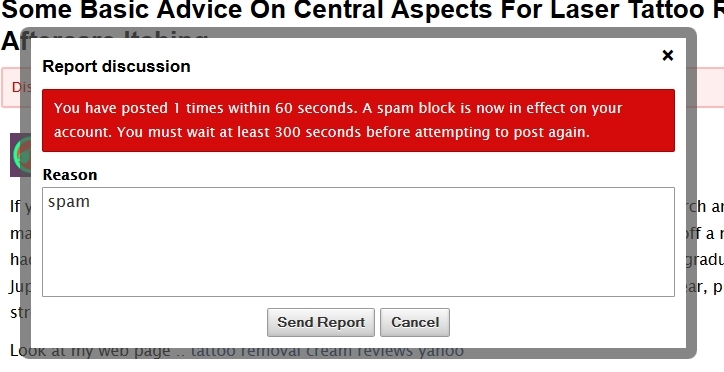 But at the same time, it also prevents spammers from spam reporting. there should be a trusted poster exclusion. Flagging should bypass the spam lock. as an aside I noticed a single user can flag the same comment multiple times, although it only sends out one notification but fills the table with more reports, it could be nice to have an event and only allow one report per comment per user, so something like this could be more easily incorporated. I think that would be a good solution for that time limit generally. It would be great if it is influenced by the user role. I agree that some of us who are not mods but are trustworthy ethical people, should have power to subvert the spam. Or hide it from the list once one or two of us has flagged it then the mods can decide to ban or whatever. Must say it was strange to get spam blocked when flagging spam.. But blocking spam does not generate anything afaIk ... how can we generate points ? you are correct, I was pointing out when we were "trusted" for something entirely different, and when MVP's had more powers. I can say that I can be trusted for spam flagging. No that was a big troll in a small body... that is what was deceptive and only troll experts could be aware of this at the time. And peregrine and basically all of those in the top list and a few others who are trusted and visit regularly so as to be useful when spam happens. Does not happen too often though. Which is good. Naaa! I didn't mean role (although I've said it), I meant rank. Everyone except for users with the rank that new users have, should be allowed to flag as fast as they can. That's how I would configure it (but I guess there is no way to configure it in such detail by now). Hmmm... being Verified should bypass this check, imo.